Happy Birthday to me! I promised myself that if I continued to sew until my birthday, that I’d treat myself to a new sewing machine. 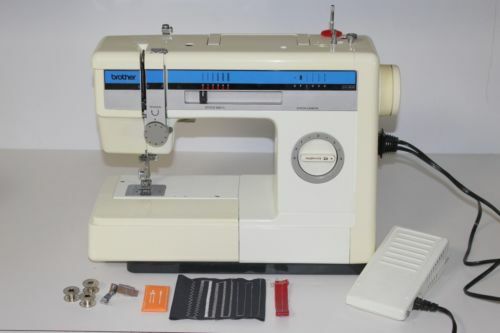 Up until now, I’ve been using my mum’s old brother sewing machine (Brother VX809). It has worked perfectly well, but from reading all the sewing blogs I’ve followed, I’ve learnt that with a new machine I could have many magical things, including: automatic tension settings, invisible zip feet, automatic button holes, and stitches other than straight and zigzag. Then there are other considerations such as whether I want to be able to do embroidery and do I want an overlocker for stretch fabrics and finishing seams. The idea of being able to do my own embroidery, especially creating my own designs, was really exciting. I spent a long time researching machines and finally decided that I was unlikely to want to do embroidery often enough to justify spending extra money on an embroidery machine. Embroidery doesn’t really figure in my style and it’s not something to do on a whim, given the cost of the threads. I’d get a much better machine if I didn’t get a combination sewing and embroidery machine, and the software for creating your own designs is really expensive too. After more research online, I decided that I wanted the Janome Memory Craft 6600P which was just within my budget and I set about finding somewhere local I could buy it. I like to buy local whenever I can. I was recommended the Janome sewing machine sales and service unit in Leeds Kirkgate market and they were fantastic. They first questioned whether I really wanted that model, since it was very heavy duty and taking their advice I ended up with a different and cheaper model – the Janome Memory Craft 5900. This left me with some budget for an overlocker, and again taking their recommendation (Janome 9300dx), I placed my orders. To avoid any unnecessary suspense, I’ll tell you now that I couldn’t be happier with my choices. They are amazing – this is one of my pre-dated posts and I’m writing this over a year after I got my new machines. It didn’t take me too long to get used to them and I quickly learnt to re-thread my overlocker, after one of my cats broke into my sewing room and ‘kindly’ unthreaded it for me. It’s not as hard as everyone makes out, although there was some unrepeatable language at my first attempt! What machine do you use? Do you have a machine that you dream about owning?